Dr Sheikh Sultan touring the park after the launch. 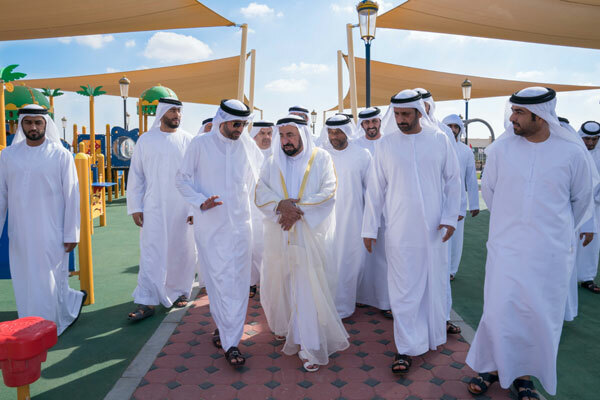 HH Dr Sheikh Sultan bin Mohammed Al Qasimi, Supreme Council Member and Ruler of Sharjah, has opened the Souq Al Juma Park and the Sports Complex of Mleiha Sports and Cultural Club in the Mleih area of the emirate, said a report. Souq Al Juma Park project has been built at an investment of Dh1.1 million ($299,470) over a 3,000-sq-m area, reported state news agency Wam. It is part of the Government of Sharjah's initiative to provide various recreational facilities and natural parks as an integrated outlet for families that combine shopping, recreation and entertainment, it stated. At the launch ceremony, Dr Sheikh Sultan unveiled a comprehensive programme for the stadiums development and clubs in the central region, where three buildings are being implemented other than the sports complex. He also announced plans to open the sports complex in the area of Al Batayeh next month, and the one at Al Madam area in January, said the Wam report. The sports complex of Mleiha Sports and Cultural Club has been set up at a cost of Dh45 million. The complex consists of two floors, which includes a range of integrated sports facilities, it added.